I judge an Assassin’s Creed, crazy me, by the overall quality of its world design and the quality of the high quantity of things these games give us to do. I therefore cannot judge the not-yet-released Assassin’s Creed Syndicate, of which I’ve only played for five minutes in the South Hall of the Los Angeles Convention Center. I can, however, be my usual optimistic self about two things. In the slice of the game I played at E3, I was Syndicate’s male assassin, Jacob. (That’s as opposed to his sister, Evie, who is also a playable character.) I was set about in a part of London where I could murder some ruffians and start a gang fight. To do so, I first needed to reach a high vantage point, which I attempted to achieve by climbing the facade of a building. You can do this, and do it smoothly in AC Syndicate, but climbing the side of buildings in an Assassin’s Creed is so 2007. And so 2009, 2010, 2011, 2012, 2013, and 2014. How very Batman of him, right? You may not get this from the footage, but you can create a zipline between your assassin’s position and any spot that he or she—not necessarily the camera—is facing. When I played, I used the zipline to get over an enemy and then drop down and assassinate him. In this cool train-station area, they’re using the zipline to catch a train. Let’s now consider the GTA stuff. In the hype reels for Syndicate, we’re told that this new AC is the first game with fully systemic vehicles affecting all the core pillars of the franchise, which I guess is true if you don’t count the boats in AC IV as vehicles or if you never used them for stealth, which I guess you kind of couldn’t. Anyway! We know what they’re really trying to say, right? City-based gameplay in the AC games has gotten boring and repetitive. Even the lovely Black Flag, which was full of fresh or improved ideas when you were sailing, was nearly out of innovation on land (Anyone up for another tailing mission? Fancy a chase across some rooftops?). 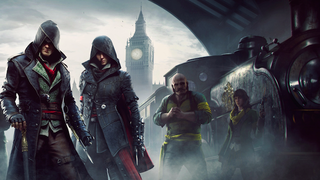 The city-based gameplay in Assassin’s Creed needs some new ideas. We got some with the Templar-based gameplay in last year’s wonderful Assassin’s Creed Rogue, but that’s not enough. Assassins need innovation, too! I’m more than happy to go with the idea of Grand-Theft-Horse-And-Carriage, if that’s what they want to try this year. You can jack any of the vehicles in the mean streets of 19th century London. You can get chased by cops in their own carriages. Better still, you can fight a guy on top of your carriage, then jump onto another one and jack that. Do two possibly-borrowed ideas constitute a great, refreshing new Assassin’s Creed? Probably not all by themselves. For all the attention Unity’s technical performance got last year, I felt the game failed due to dull mission design and even duller sidequests. Syndicate will benefit if it has an interesting lead character (or two), better missions, and side adventures that rank with the best of what was tucked in II, Brotherhood or—you will disagree with me about this—III. I am excited to see what the Syndicate team does with their rope-launcher and their vehicle-filled streets. Hey, I might even be ok with a vehicle-tailing mission or two!